TLC’s reality show SISTER WIVES is back for another season. Tonight’s episode is called, “Mother-in-Law Invasion,” and on tonight’s show on Mother’s Day, Kody is visited by all nine of his. Meanwhile, the wives discuss college costs. Did you watch last season’s finale Tell All Episode? We did and we have the recap to get you caught up, right here. On last season the family had just moved to Las Vegas. They had moved into their new homes and were getting use to living next to each other again. Meanwhile rumors have been floating that Sister Wives would be cancelled, but good news Sister Wives is back for eight more episodes. On tonight’s season premiere the family will be tweeting live. We will get to see how the family is doing living in Las Vegas. Tonight it’s Mother’s Day and Kody’s mothers-in-law are visiting, 9 moms in all. Kody makes Mother’s Day breakfast. The wives discuss how to pay for their kids starting college, and how to improve their relationships before the commitment celebration. After therapy Kody and his wives head home, and he heads to Meri’s house to discuss their daughter’s college plans. There is an issue with Meri and Kody’s daughter Mariah’s college tuition. The college that she wants to go to in Utah is very expensive, and her scholar ship was not as much as they expected. Kody and Meri break the news to Mariah that they may not be able afford to send her to the college of her dreams, West Minister. Kody has presents for his wives. He has been working on hand-made personalized jewelry for his wives for a awhile. He gave Meri a necklace with the Latin word for “loyalty.” She loved her new necklace. Janelle loves her personalized necklace as well. Robyn’s personalized necklace is of a Phoenix, and it is related to a song that Kody and her both love. Christine doesn’t like her necklace though. Kody and his wives’ therapist Pat pays them a visit at their new home. It is the first time they have seen Pat since they moved to their new homes. Pat is going to accompany the family to Arizona for a marriage retreat. They have brought their new therapist Nancy along with them as well. Kody is excited about the retreat because it is ran by hippies. The first thing the family does is head out on a hike and meditate on a cliff. Kody isn’t really into the meditation though, because he is getting covered in ants. 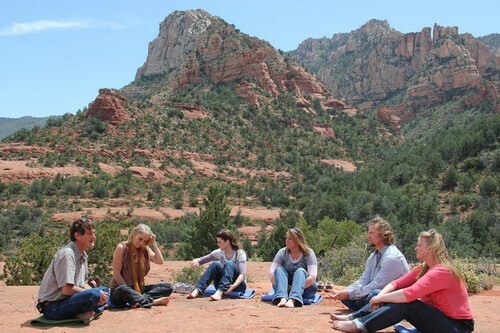 After their hike they had back to the retreat and meet with their new therapist Nancy. She has done personality tests on Kody and his wives and she has the results. She reveals that Meri is a “reformer,” and she is driven to tell the truth no matter what. Meri bursts into tears, and then Nancy criticizes the way Kody speaks about Meri. They are off to a rocky start with their new therapist. Janelle confesses that she is happy being separate from the family, she doesn’t feel the need to be really involved in everyone’s lives. The second day at the retreat, Robyn is feeling nauseas so she opts not to join Kody and her sister wives in their family activities. The Browns head out on a hike with a spiritual leader. Halfway through the hike, Pat has to leave them and head home. She says her good-byes and heads back to Utah. It’s time for the Brown family to meet with their new therapist Nancy individually. Janelle is first. She confesses to Nancy that she doesn’t get along with Meri and Robyn. Kody confides in Nancy that he wants to work out a relationship with each of his wives. Robyn wants to be closer to her sister wives. Christine wants to put everything family-related on paper, and really wants the mission statement to be completed. After their individual meetings with Nancy they head outside to do an exercise to see how close they really are a sa family. Kody stresses to his wives that the family can’t revolve around him, they need to be able to get along with each other without him. If he ever dies, it will be up to them to keep the family together. The Browns leave the retreat feeling optimistic about their family, and ready to tackle their family mission statement.